Wouldn’t it be nice to send a text and have things just magically happen for you? 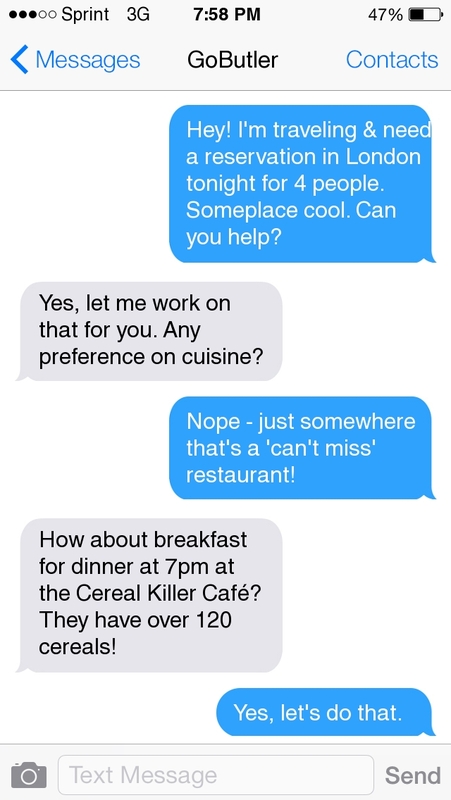 GoButler thinks so, and is launching an SMS-based concierge service to help you get through your day, and can help you with just about anything. While the service may be most critical in those “uh oh” moments when you realize you’ve forgotten to do something like book a hotel room, GoButler is available any time. You can even use it to schedule things in advance, find out when a business closes or make a restaurant reservation. 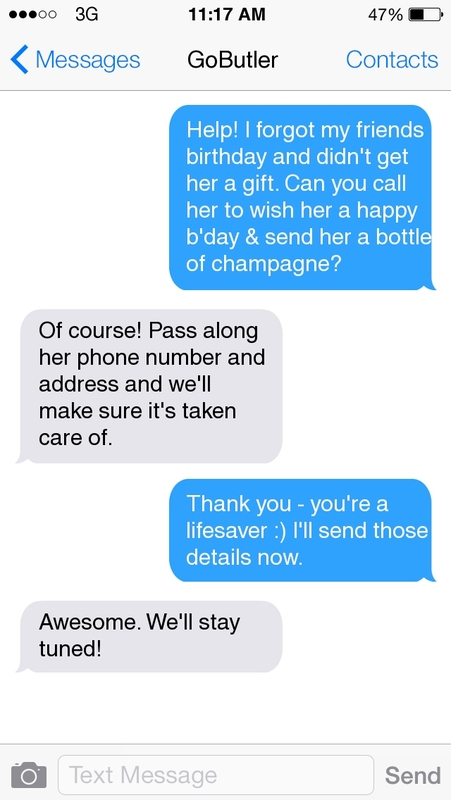 Once a text request is sent, GoButler’s puts users in touch with “Heroes,” which are actual human employees working for the company. They can help with whatever you’re in need of, but GoButler tells us illegal requests are automatically out of the question. 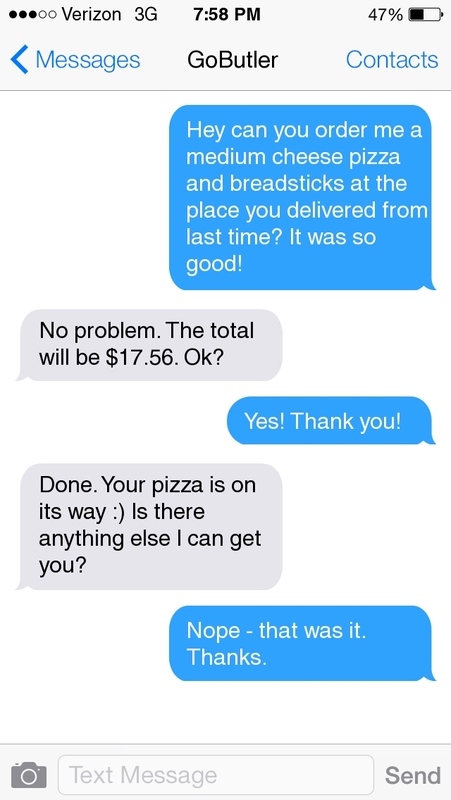 The service has been in testing for eight months or so (with 100,000 users) in six countries, and GoButler says about 60 percent of requests are for delivery items like food, flowers or groceries. Around 20 percent is travel (flights or hotel stays), and 15 percent is what the company refers to as “value” items like spa days or restaurant reservations. The remaining 5 percent of queries are simple information requests. If you need to do something like book an Uber ride, GoButler has corporate accounts it can use to get you what you need in a pinch. Should you need something that may require payment in advance or a credit card hold, GoButler will provide you with a link to enter your payment information with its partner, Braintree. Once your payment info is entered, GoButler offers to keeps it on file for future orders. Each time you request something that requires payment, you’ll be asked if it’s alright for the company to charge your card. While GoButler’s founder and CEO Navid Hadzaad says the SMS interface is easier and more natural for users, he does hint a standalone app is incoming. Hadzaad also says SMS is critical to the company because users can send a text even when data service may not be available. The service is also free to use, and is available in the United States, Canada, United Kingdom, Germany, Austria and Switzerland. 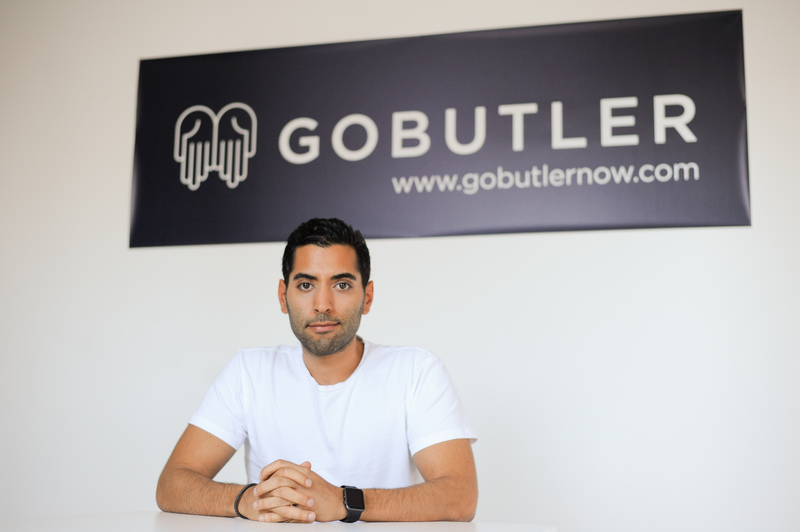 GoButler just sourced $8 million in venture capital to keep the service free, but expect it to monetize once it becomes more mature. If you’re interested in giving GoButler a shot, you can text GO to 25400, or request a Hero contacts you via the website.